An overview of the history of Easter for kids. 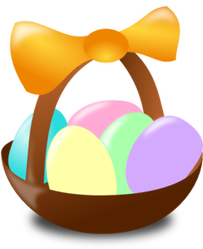 Useful information about the origins of Easter celebrations and traditions for children. My 5 year old son has been asking what Easter is all about. He always wants more information than I can come up with on the spot so I thought I'd better do some research to give him some better answers. I've put together some information about the historical origins of Easter, why Easter is celebrated when it is, and the meaning behind Easter traditions such as the Easter bunny and chocolate eggs. I've included lots of videos that you can watch with your kids and discuss. Easter is a celebration of the goddess Ēostre or Ostara. Ostara was goddess of the dawn and was responsible for bringing spring each year. With spring comes new life in the form of plenty of food to eat and new baby animals. The weather is improving after the long winter. There is a lot to celebrate at this time of year. The celebration of Ostara is not on the same day as Easter Sunday but it comes from it. We'll get to that later. We're British so our ancestors would likely have worshipped Ēostre. Modern day pagans celebrate Ostara with its original meaning. Others (like us) celebrate Easter as a cultural tradition and a connection to history. This video tells the story of Ostara for children. Many other cultures had similar springtime celebrations which have been woven into Easter over time. We recognise eggs as associated with Easter and also bunnies and chicks. These are all symbols of new life. Bunnies are known for having lots of babies and chicks hatch from their eggs in the spring. So who is this Easter Bunny character then? 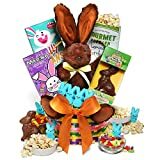 The very funny video below tells of how the Easter Bunny came from the Germanic Oschter Haws, a rabbit who layed brightly colored eggs for children at Easter. My son mentioned that his friend has told him that the Easter bunny will leave a chocolate egg at the end of the bed. He wasn't convinced. We prefer to let him come to his own conclusions about such things! 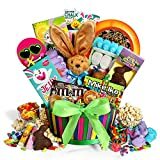 The tradition of giving children Easter baskets of gifts and candy has its roots in the stories of the goddess Ēostre and the rabbit Oschter Haws. Decorating and coloring eggs at Easter is common in many countries and cultures. Some of the most famous and beautiful decorated Easter eggs are the Pysanky eggs from the Ukraine. These eggs were decorated in springtime to give to other households to with them good health. So why did chocolate Easter eggs become so popular? Well chocolate makers saw an opportunity to get in on the Easter celebrations. 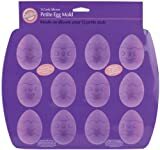 And people liked the idea so chocolate Easter eggs became popular. Hot cross buns are traditionally eaten around Easter time. This goes back to the ancient tradition of worshipping the moon goddesses by eating small fruit buns. In ancient Egypt the buns had ox horns on them. The greeks called then bouns (from bous meaning ox.) Over time the Ox horns got replaced with a cross to represent the four quarters of the moon and the greeks and the romans ate them as they worshipped goddesses associated with the moon. They also because associated with Ēostre the goddess of spring. It was considered unlucky not to wear new clothes at Easter. Everyone would try and get a new item of clothing for Easter to bring good luck. This was at a time when clothing was expensive and people couldn't just get new clothes whenever they wanted. Easter bonnets are still associated with Easter and getting a new Easter dress or outfit is the modern version of this tradition. When is Easter (and why)? Easter Sunday is the Sunday following the first Full Moon after the Vernal Equinox. Huh? The date we actually celebrate Easter now is actually based on historical data which isn't quite accurate. Having Easter move around is pretty inconvenient. There's often talk of moving it to a fixed Sunday so that could happen in future. So the key thing to understand here is that the changes in the Moon and Sun as seen from the earth have long been recognised and recorded (before modern astronomy allowed us to understand the relationship between the Moon, Sun and Earth.) Celebrations and traditions were often tied to astronomical patterns that reoccurred each year. Can You Only Stand an Egg on its End on The Vernal Equinox? It is said that you can only stand an egg on its end at the vernal equinox? It's not true. You can stand an egg on it's end any day of the year if you know how. It's a fun thing trick to learn though! It's a good example of how commonly believed things can be completely untrue! 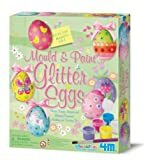 Are you looking for an Easter-themed Lego set or gift idea? I've put together a selection of my favorite Easter Lego gifts. With the day and night of equal length, this is the time of the greening. The Goddess Eostre is free of the cold Earth and all is fertile. Did you learn something about Easter? Have you ever wondered “What is Easter Day” and the origin of Easter celebrations? Here are some facts and anecdotes for you that you can enjoy and tell to your kids too.